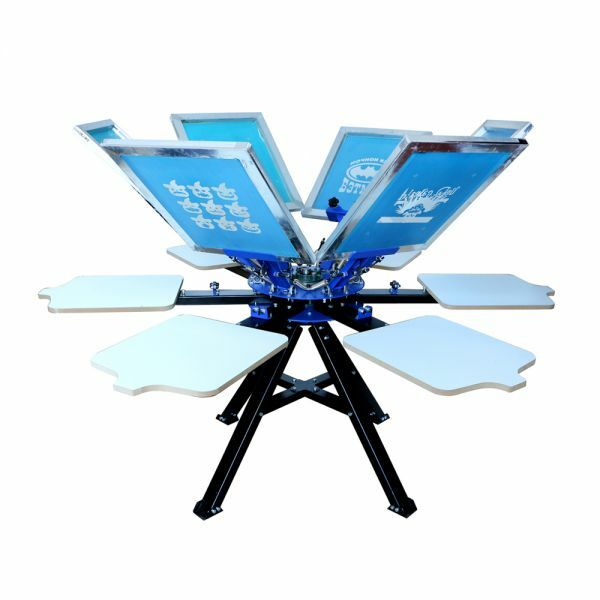 This is a simple 6 Color 6 Station Screen Printing Press, you can print onto clothing, woven fabric, metal, paper, copybook, plastic, circuit board, wood, glass, ceramic tile, leather and other plane printing substrates, which is especially suitable for small businesses and individual printing shop. *For skillful operator, two person could print 30-50 pieces 6 color T-shirt in one hour. 1.Both the chuck of the screen frame and the pallet can rotate at 360 degree;Users can Operate at any position or any pallet position. 2.Users can finish all the screen frame's overprinting positioning at any pallet station,All the screen frames'position is correct to any one pallet , the other one pallet will be correct , then the user can start overprinting.There is no need to correct the position of every pallet. 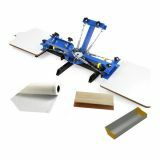 3.Each screen frame's fixing device is equipped wth precise positioning wheel,when the positioning iron on the arm placed in positioning wheel closely, it can ensure the printing precision. 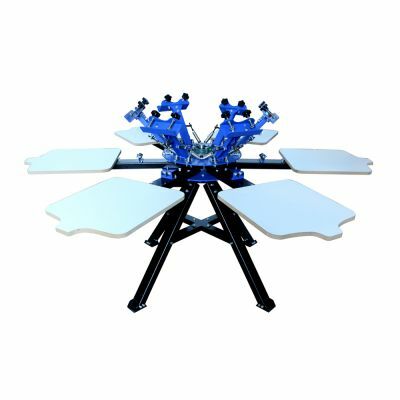 4.Each screen frame's fixing device is equipped wth big lock wheel, screen frame arm can easily fall into the metal positioning wheel when touch the two big lock wheels ,and it also can prevent the direct collision between the positioning iron and the metal positioning wheel. 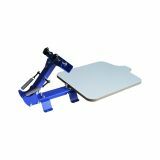 6.According to the weight of the screen frame, spring tension can be adjusted by the basket screws to achieve balance. 7.Screen frame chuck's width is (10in) 25 cm ; It is suitable for screen frame with outside size within (24 in) 60 cm and screen frame with thickness size is within 4 cm (1.6 in). 8.The screen frame chuck can be adjusted up to 5cm(2in) according to the height of the substrate. 9.The pallet is directly fixed on the pallet arm by screws. T-shirt type pallet of the machine is 55 cm (22 in) long, 45 cm(18in) wide, the thickness is 1.8 cm (0.7 in); Using furniture surface melamine high density board, the surface with small pits, and it is more suitable for printing T-shirt when scraping the pallet glue.